In an aluminium loaf pan, spread the chocolate ice cream evenly across the bottom. The layer should be a little less than 1 inch (2 ½ cm) thick. Place the loaf pan in the freezer for 10-15 minutes to allow the ice cream to firm up. Repeat step 1 for both the vanilla and strawberry ice cream until the loaf pan is filled with the 3 layers. Return the loaf pan to the freezer and allow it to freeze completely, about 2 hours. Prepare toppings before removing the loaf pan from the freezer. Combine the chocolate with the coconut oil and melt by microwaving, stirring every 20 seconds, until fully melted. Add crispy rice to melted chocolate if desired. Remove the loaf pan from the freezer and transfer to a cutting board. Take the popsicle sticks and press them firmly into the top of the ice cream, spacing them about 1 inch (2 ½ cm) apart. Using a pair of scissors, quickly cut the outer rim of the aluminium pan. This should allow you to peel it away and reveal the layered block of ice cream. Once the pan is removed, cut the ice cream between the sticks making 8-9 individual pops. Dip the pops in the melted chocolate and transfer them to a parchment paper-lined baking sheet. Decorate with desired toppings. 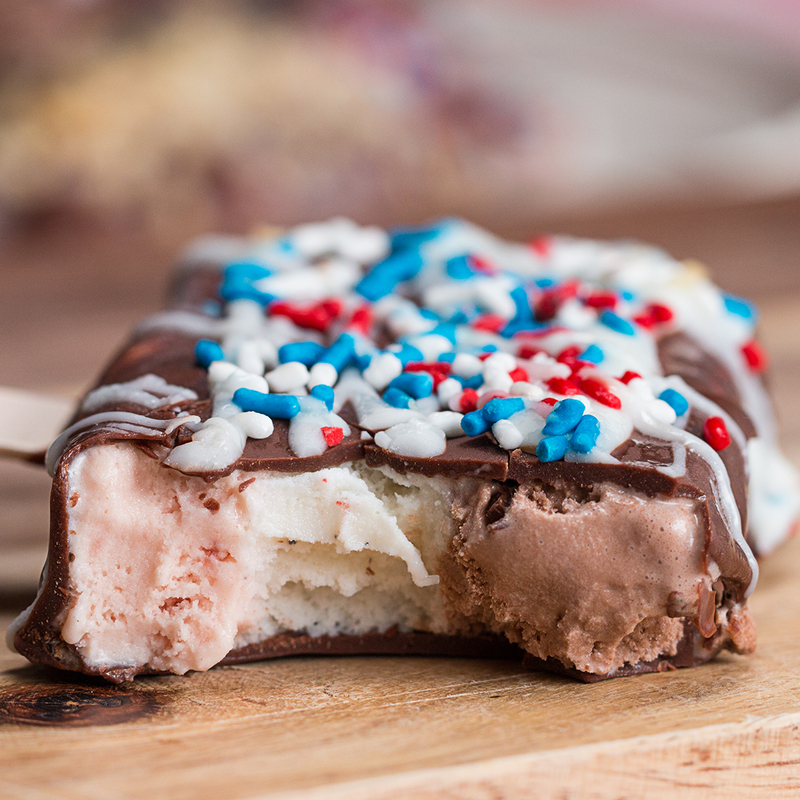 Once finished decorating, transfer the ice cream pops to the freezer until ready to serve.